The Sunset Drive-in Movie Theater provides a service that, growing up in northern Delaware, I didn’t know still existed. 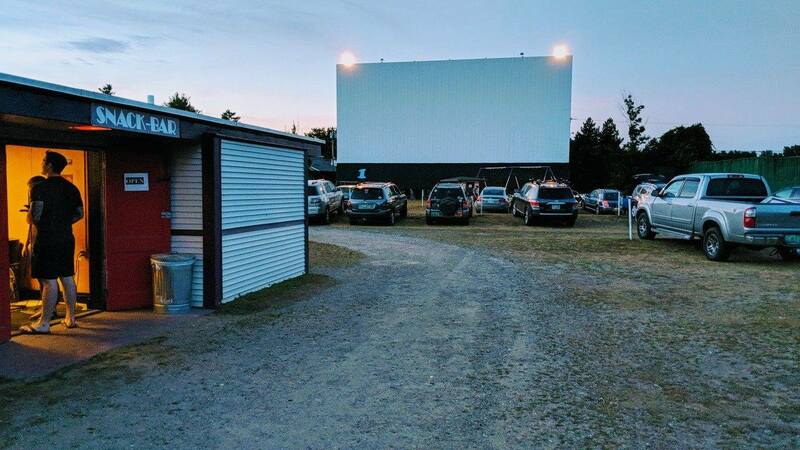 Sure, everyone knows that drive-in theaters used to exist; it’s where you’d take your girl once you were going steady but were tired of the soda fountain or the roller rink. I never understood why they seemingly disappeared, but if you’d asked me a year ago where to find a drive-in theater, I’d have said you were out of luck. That changed when my group of college friends who stayed in Burlington after graduation went to the Sunset Drive-In with my girlfriend. I didn’t resent not going; I was living four hundred miles away. They had a great time, of course, but I was left wondering what the experience of seeing a movie on the big screen from the comfort of my own driver’s seat is really like. Then I moved five minutes away from the blasted thing, and I can’t fully understand why they went so out of style. The internet says that a large part of the issue was digitization; digital projectors need special parts to project on screens that big. The biggest issue, though, was the breakout of color home tv’s and video rental. The Sunset Drive-In bit the digitization bullet and strode boldly into the twenty-first century, complete with upgraded radio transmitters for louder, wider coverage. They also provide, free of charge, a jump start if your car battery dies. I drive an ’81 Mercedes; it’s packed with features that were once cutting edge. Now, however, they’re ceasing to work, one by one. Half the power windows, the moon roof, and the radio all still work with no problem, though, so watching a brand new movie from that cushy driver’s seat, cool Vermont air wafting lazily around us was truly worth admission. Entry, by the way is relatively cheap when you factor in the second screening—and the fact that nobody makes you leave in between. That’s right, folks: every night’s a double feature at the Sunset Drive In, if you’re willing to brave the mosquitoes. Lucky for you, repellent is sold at the snack bar in the center of the (huge) field the screens all face. There’s a grill in there, offering burgers and dogs that do not cost an arm and a leg. There’s popcorn, of course, and soda fountains and an ICEE machine, all for a fraction of what they’d cost at an indoor theater. After my experiences with Sunset, I’m baffled by the disappearance of drive-ins across our country. Sure, it’s not dark enough at night everywhere, but if one in Northern Vermont can stay open, weather isn’t enough of an issue. Perhaps not enough people share my enthusiasm. In any event, drive-ins have become a novelty that I’ll have to take advantage of as I come by them. You’ll know when they turn up; I promise.